Bank Credit Dnepr (Kyiv) is boosting its charter capital by UAH 1.173 billion or 43.1%, to UAH 3.893 billion via an additional issue of shares. The bank reported in the information disclosure system of the National Commission for Securities and the Stock Market, the decision was made by the only shareholder in the bank on November 5. The bank will privately place the additionally issued shares with a face value of UAH 1. The sole shareholder will buy the shares. 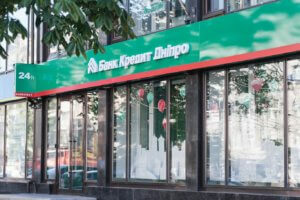 According to a press release from the Bank Credit Dnepr, referring to Board Chairperson Olena Malynska, this capitalization program is an integral part of the restructuring plan developed according to the results of the bank’s stress testing by the regulator and in accordance with its recommendations. “The shareholder capitalizes the bank for the fourth time in three years, thus confirming confidence in the success of the post-crisis business strategy of the financial institution. Our further systematic work to improve the financial performance and asset quality, increase efficiency and the volume of new business, along with systemic support from the shareholder guarantee the implementation of the restructuring plan in a timely manner and provide an opportunity to start a sustainable profitable activity,” Malynska said. Bank Credit Dnepr was founded in 1993. Its sole shareholder is Brancroft Enterprises Limited, which indirectly belongs to Victor Pinchuk. The bank ranked 21st among 83 operating banks in the country as of July 1, 2018 in terms of total assets (UAH 9.08 billion), according to the NBU. Bank Credit Dnepr (Kyiv) has increased its charter capital by UAH 1.199 billion, or 78.8%, to UAH 2.72 billion through an additional share issue. According to a press release of the financial institution, on August 15 the bank registered the new wording of the charter in connection with the increase of the charter capital. Capitalization was carried out by a private placement of additionally issued shares. The bank ranked 21st among 84 operating banks in the country as of June 1, 2018 in terms of total assets (UAH 9.439 billion), according to the National Bank of Ukraine. Net profit of Bank Credit Dnepr (Kyiv) in January-June 2018 totaled UAH 40.251 million, the bank has said in a press release. “The profit of Bank Credit Dnepr in April-June 2018 totaled UAH 157.175 million, and in H1 2018 the bank saw UAH 40.251 million in profit,” the bank said. Net interest income in January-June 2018 grew by 33.2% year-over-year, to UAH 85.181 million. Net commission fee grew by 28%, to UAH 64.782 million. Net worth in H1 2018 rose by 2.4%, to UAH 838.281 million. Assets totaled UAH 9.078 billion. Funds of clients accounted for UAH 8.183 billion. Bank Credit Dnepr was founded in 1993. Its only owner is Victor Pinchuk. The net loss of Bank Credit Dnepr (Kyiv) for January-March 2018 amounted to UAH 116.924 million, which is twice as much as in the same period of 2017. According to the financial report posted on the bank’s website, its net interest income decreased by 36.9%, to UAH 40.23 million, net commission income by 30%, to UAH 29.873 million. Other non-interest loss amounted to UAH 24.105 million against UAH 30.15 million of other non-interest income in January-March 2017. Operating expenses increased by 4%, to UAH 127.942 million. The bank’s assets for the three months decreased by 9.36%, to UAH 8.417 billion. The loan portfolio was almost unchanged and by the end of March stood at UAH 4.116 billion. The bank ranked 21st among 84 operating banks in the country as of January 1, 2018 in terms of total assets (UAH 9.411 billion), according to the National Bank of Ukraine.